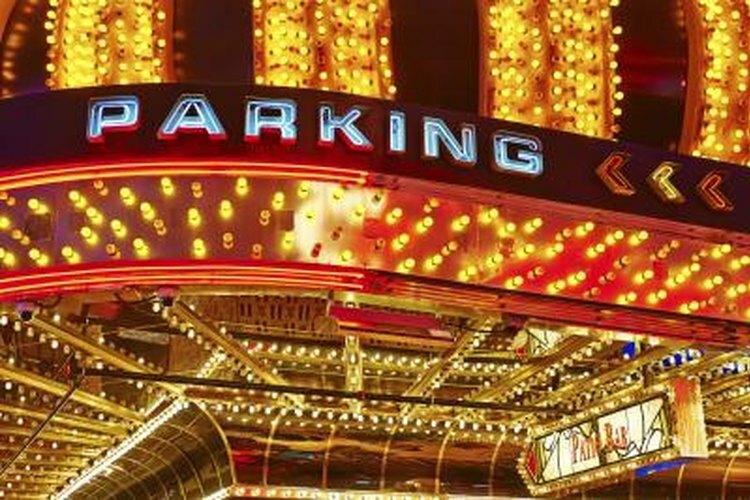 Overnight RV parking is not allowed at Las Vegas casinos without special permission. Back in the 1940s when Las Vegas was first making its gambling debut, small motels and trailer parks were the area's primary accommodations. Over more than 70 years, casinos have grown in size and stature, and luxury rooms have become the name of the game. You'll still find a couple of RV parks at casinos along the Boulder Highway, as well as some you can walk or drive to within a few minutes of the Strip. Sam's Town Hotel and Gambling Hall brings western flair to the casino scene. Beside its gambling floor, Sam's Town has family-friendly attractions that include an 18-screen movie theater, bowling and live entertainment. The adjacent RV park provides amenities that make it convenient to stay for days -- or months -- on end. All sites have full hookups that include cable TV and telephone, and pull-through spots are available. Take a dip in one of the pools or hot tubs; wash laundry on site; enjoy a hot shower. Pet runs, barbecue grills, grassy lawns and mature foliage create a park-like environment. Sam's Town lies along the southeastern side of the city on the Boulder Highway. Just a mile northwest of Sam's Town, Arizona Charlie's Boulder has a full-service casino complete with slots, video poker, gaming tables and a bingo parlor. Stay just outside the casino at the establishment's RV park, which has 200 spaces accommodating rigs up to 70 feet long. When you're not gambling, take a dip in the heated pool or hot tub, and enjoy the park's deluxe clubhouse. You'll find amenities there that include a fitness center, big-screen TV and pool table, in addition to showers and laundry. The property is dog-friendly and has its own dog run. Three casinos lie within walking distance of Las Vegas RV Resort on the Boulder Highway. Sam's Town Casino is a half-mile south, with East Side Cannery .4 mile further. Arizona Charlie's Boulder is the same distance north. The establishment has picnic tables at each site, extra-long sites up to 100 feet long and full hookups. The menu of resort amenities includes swimming pool fitness center, Wi-Fi, a clubhouse and spa. Just across the street, Road Runner RV Park has similar amenities. Both RV parks allow pets, but Road Runner RV Park limits dogs to 30 pounds or less. While you won't find any RV parks on the Strip itself, you'll find some within a couple of miles. While you might expect to find Riviera RV Park at the casino of the same name, it lies 4 miles east. The park has basic sites, and amenities such as showers, flush toilets, pools and pull-through spots. Oasis Las Vegas RV Resort lies 3.5 miles south of Sunset Road, the southernmost point of the Strip. The park has two swimming pools, including a beach-like family pool. You'll find an 18-hole putting course, on-site restaurant, ballroom and fitness center. The resort provides full hookups, hot showers and laundry facilities.